Why did the turkey makers say on their package that an 18lb bird would only feed 10 people? It was lies I tell ya. All lies. When my dinner for 12 ended up becoming one for 13 that damned package had me worried there wouldn’t be enough. However, those big fat liars, there was definitely enough… and there was more than a pound of turkey meat left over. Starting with the turkey, I brined it over night, and then rubbed greek seasoning, two sticks of butter, and bread crumbs between the skin and meat before roasting. I also rubbed the outside with butter, put it in one of those cooking bags, and left it alone while it roasted. The meat tasted awesome-sauce, and to my knowledge no one became violently ill in the wake of eating it. 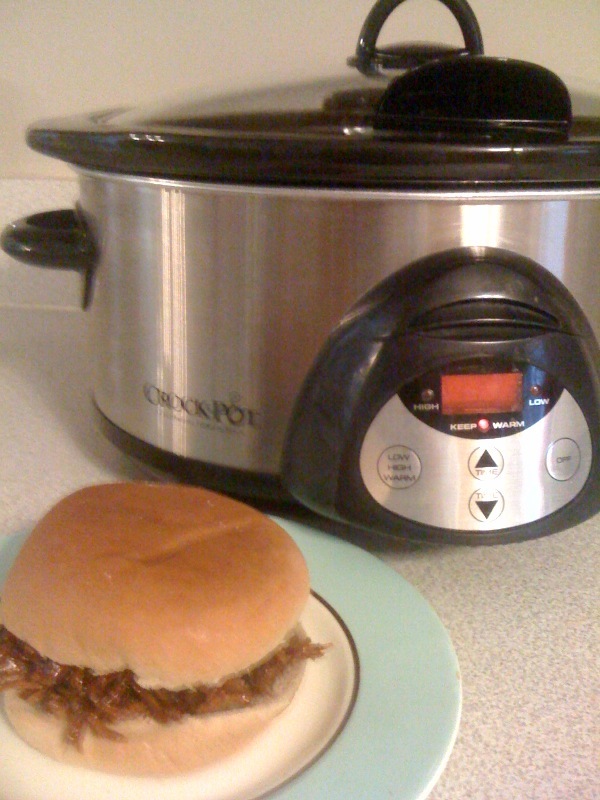 Combine leftover turkey, rootbeer, liquid smoke, chicken stock, and BBQ sauce in slow cooker. Cook for four hours on high. Invite friends and family over to eat and watch the football game. Serve with buns and beer. I seriously am in love with this slow cooker BBQ recipe, and if you happen to try this and don’t like it, well, then I just don’t think I can know you. Tasty idea! I don’t have left over turkey because I was sparred the cooking duties this year but this recipe makes me want to buy a turkey and go through the ritual. I bet this would work with a defrosted turkey breast, too! I never would have thought about BBQing the leftovers! Sounds good – I will have to give this a try!